Doodle your way into a big painting! Doodling is really just mark making . . . marks that happen when you are otherwise occupied. These intuitive marks that flow from you naturally while you are doodling are an expression of your true style, like your handwriting. 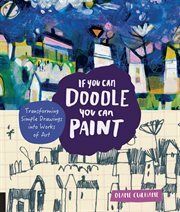 This book looks at our doodles as resources; treasures from which we can create full-sized paintings. Even if you don't consider yourself a doodler, the exercises and techniques in this book will give you a fun way to tap into your personal style, the voice that comes from deep inside. Through the exercises in this book, you will dig into your creative life to find a style that is authentically yours. The invitation starts with a pencil as you work through automatic and specific doodle assignments. Eventually, you will learn how to size up and combine these doodles into larger compositions. Then, you will begin mixing it up with watercolor paints and, finally, with acrylic paints. We will:- Dig for treasure/doodle- Observe, arrange, and study- Make folded books for doodle-ready surfaces- Copy your images with hand/eye coordination- Scan and enlarge your doodles- Add color combinations with colored pencil and acrylic paint- Create compositional grid paintings, and- Create a large complete painting!